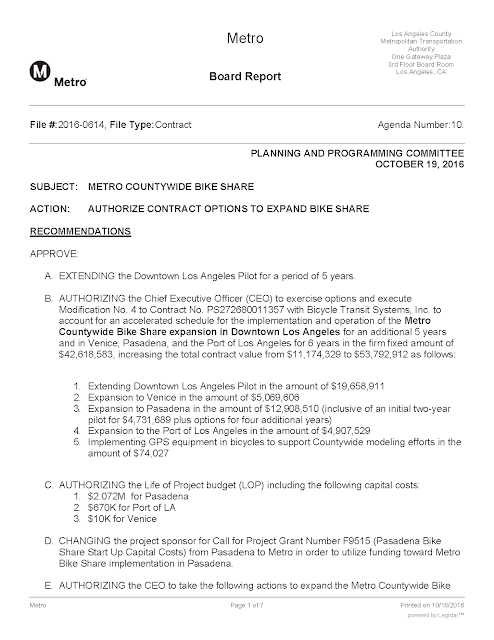 Under the contract approved by the Metro Board on Thursday, bike share would arrive in Pasadena, the Port of Los Angeles and Venice next summer. Final station locations will be announced at a later date. In the first quarter, the program surpassed 50,000 total rides and 2,000 annual flex or monthly pass-holders. As another measure of performance, we also track number of rides per bike per day. The system goal is to reach two rides per bike per day by the 12 month mark of operations. We are at one ride per bike per day and showing steady growth in this metric. The Metro Bike Share program continues to work towards increasing program awareness, growing ridership and increasing pass sales. If you’re interested in taking a bike for a spin in DTLA, click here to learn more about the location of bike share station locations and pricing. Ridership on Los Angeles County’s new bicycle sharing system has been smaller in its first months than on similar programs in other major U.S. cities, a Times analysis found.